So you know those folks who put on the biggest gun show in the world every year, the SHOT SHOW? if you don't, you should. 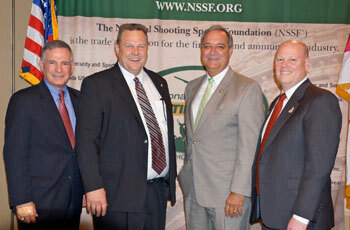 The National Shooting Sports Foundation (NSSF) is the premiere trade association for the gun industry. Take one look at their board of directors and you will see what I mean. Smith and Wesson, Hornady, ATK (got ammo? Thank ATK), Beretta, and Browning Are represented. Today, these guys announced their legislator of the year award, and one of Montana's own was graced with the honor. Check out their blog post on the awards. A tip of our Stormy Kromer to Senator Tester on a well deserved acknowledgement of your efforts.